The other day I was at a meeting at the Mall at EDSA Shangri-La and it hadn’t occurred to me that it’s Valentine’s Day. Being that I’m Iglesia Ni Cristo (Church of Christ), we don’t really celebrate it, so don’t flame me for not being a romantic. Anyway, as my assistant and I left the mall, it became obvious to me that getting back to Cubao was going to be a challenge. So after looking at the taxi queue and the bus line queue we decided to walk the two blocks down EDSA to Megamall to see if it was any better. It wasn’t. 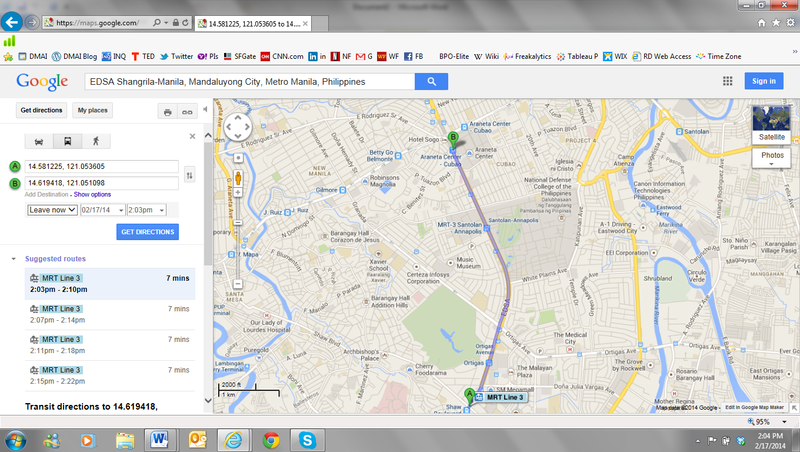 So then I decided why not just walk back to Cubao. It shouldn’t take more than an hour or two, so and it would be good exercise. So on that long walk, actually a couple of kilometers, that actually took just under two hours, I had a lot of time to reflect on things. Here are ten things that occurred to me during the walk. 1. Its not actually a bad walk, with the exception of a few tight squeezes at the MRT stations and in front of Mega Mall, it was pretty wide open side walk most of the way. 2. Don’t Go to the Malls on a Holiday. The malls in the Philippines always get crowded on Friday nights, but a Friday Night Valentine’s Day… takes the cake for the busiest I have ever seen. 3. The MRT is way to overcrowded. We didn’t even try taking the MRT (Manila’s light rail network) because you can see by the passing trains people were crammed in like sardines. Whatever happened to the plans to modernize the now 20+ year old rail service? 4. Nice Restaurants are so overpriced. 4,000 PHP ($100) for a steak dinner. When you compare prices between the US and the Philippines, fine dining is one area way out of whack. So many places to eat at EDSA Shang, so few offer a nice meal for a good price. 5. There are not enough Taxis when you need them. If you spend time in Manila, you know the drill. During off hours, taxi drivers fight over you, but during rush hours you have to fight for them. Its one of the greatest variations in ebb and flow business I have ever see. I’d argue even worse than Manhattan. 6. Robinson Galleria has the worst Taxi Queue in Metro Manila. Green Hills and EDSA Shang Mall are close runners-up, but the taxi queue at Robinson Galleria is the slowest moving one I have ever stood in. 7. There are too many buses. Even when they are crowded to the brim with people and offering the cheapest way to get up and down the EDSA for most people, there are too many buses. The biggest cause of traffic congestion are buses who cut in and out of lane, stop in the middle of the road and all in all are driven by want to be Hollywood stunt drivers. 8. Too Many Ways to Waste Money. When you walk down ESDA, besides the dozen malls, you also see countless showrooms for high-end cars, you see a lot of business whose cliental can only by the wealthy. If you have money there are so many ways to waste in EDSA, while the masses ride by in a crammed bus or are stuffed away on the MRT. Its one of the worst visualizations of the rich-poor divide in the Philippines. 9. There are more condos being built than anything else. Its mind-boggling that they boom keeps booming. When you try to do the math in your head, how many condo have been built and how many multitudes of more are under construction and then you take into account the number of OFWs, Call Center Agents and people with enough money to invest, there are still more vacant or going to be vacant condo units then there are buyers. Talk about a bubble that has to burst. And 10. Mary Me, Oliva is the talk of the town. Up and down EDSA there are a series of bill boards with the message “Olivia, will you marry me 21414.” The speculation is rampant about what the heck they mean. But whatever the origin, its one of those things that has every one buzzing about it. Posted on February 17, 2014 February 18, 2014 by DMAIPHPosted in News and EventsTagged Dan Meyer, DMAI.